Image caption The incident came to light after local media reported the details on Tuesday. Scholars from Carnegie Mellon University and Indraprastha Institute of Information in Delhi said that 76 of the 127 selfie deaths globally in 2014-15 had been reported in India. The latest incident came to light after the local press reported the details on Tuesday. "While taking photos, they (the teenagers) saw a train heading towards them and moved aside. But another train came from the opposite side, and they were stuck between the two. 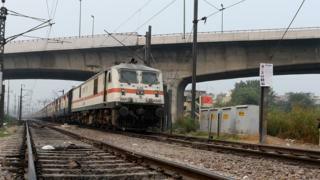 The victims were hit by one of the trains," The Indian Express quoted a police officer as saying. A railway police officer added that the teenagers had hired a professional camera for the shoot. "We have recovered the camera from the boys that was used for the photo-shoot. It had some pictures and videos also. The video has been sent to be analysed, while the photographs confirm they were randomly jumping from one track to another," Deputy Commissioner of Police Parwaiz Ahmed told the Hindustan Times. Last year two students drowned while taking selfies in a swollen river in a remote part of the northern state of Uttar Pradesh. And the police in Mumbai declared 15 locations as places where taking selfies "can be dangerous" after an 18-year-old girl drowned in the sea while taking a selfie.